Absolute MDrive® products integrate a 1000 line count (4000 counts/rev) multi-turn absolute encoder with 1.8° 2-phase stepper motor and control electronics. Rotary and linear motors are available. IP65-rated products for protection against dust and moisture are also available. These products can reduce machine complexity, size and cost for a wide variety of motion applications. Robust Lexium MDrive (LMD) products are enhanced with a multi-turn absolute encoder at an extremely competitive price. 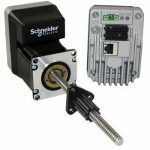 Internal to the product so there is no increase in size, absolute encoders detect and store position information even when powered down. This can eliminate homing routines and reduce setup time at system startup. At an extremely competitive price, multi-turn absolute encoders enhance LMD integrated motor and electronics products while fitting in the same compact footprint. OEMs who want to reduce machine size, cost and complexity will find robust Lexium MDrive with Absolute Encoder products deliver exceptional performance and value for many applications.